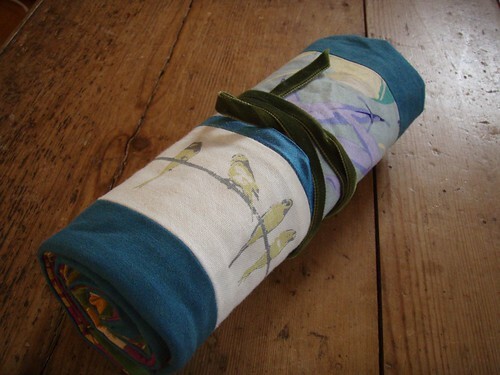 First sewing resolution project of 2010 is a needle roll for my double pointed knitting needles. I was spurred on by my friend Sarah who suggested this as a co-crafting project for our social evenings / afternoons in the studio. She’s made one too, but more subtle and not quite as complicated! This took considerably longer than the purple zebra dress, and I designed it from scratch, so I really ought to be as proud of this as I would be of a garment, but it doesn’t feel terribly ambitious. Having said that, I LOVE it. Making it was a pain, designing and adjusting and unpicking all the way until I finally reached a satisfactory (although not ideal) solution. 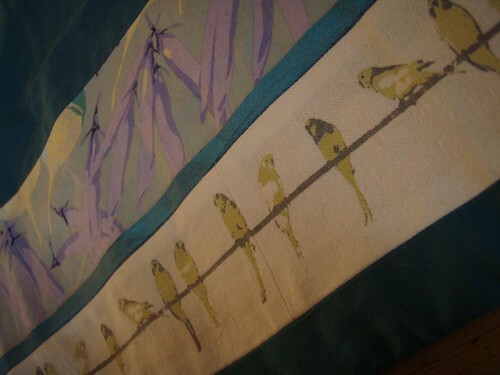 For the outside I used another Martha Negley print with vegetables in lilac and blue – a scrap of the lining I used for my friend’s wedding jacket 4 years ago! You would never know that jacket was lined with a print of turnips, cabbages and beans, would you? She’s a gardener. I’ve also got a skirt made out of the same print in a different colourway, which I bought at the same time as the jacket lining. Could not resist. And those beautiful birdies on their wire is a scrap from my friends Massey and Rogers. 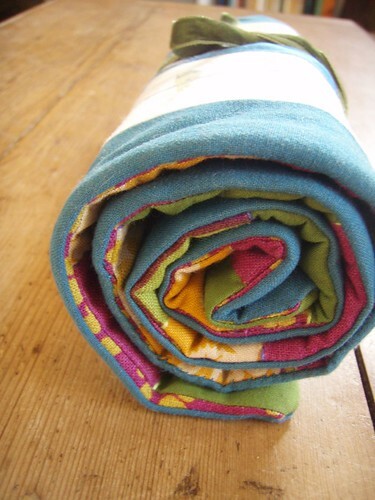 This is the same fabric range that the bag in Popular Patchwork is made from, by the way. Birdies galore! Project two (also started in 2009, just) is almost done. Tailored Tweed Trousers. And project 3 will be a new dress to wear for my birthday, which is – gulp – a couple of weeks away. To come (probably tomorrow) the full behind-the-scenes story of teaching Mark Watson to sew buttons on! I love the case! I need to make myself one. I have one of the "binder" cases, but I have far too many needles for them all to fit in there, so they're just floating around. I'll probably end up making one for DPN's, one for my long straights, and one for my circulars although no idea on how to go about that one as I want something that will CLOSE that I can carry with me.Keep up the good work! Looks good! I need to make one of these myself actually. 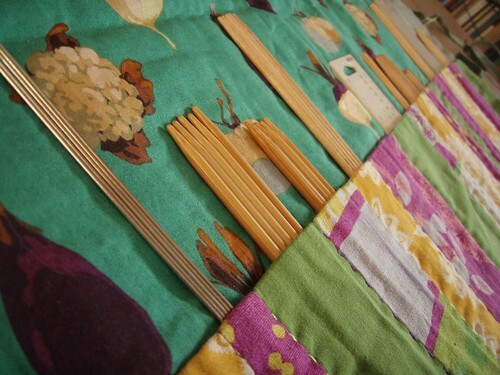 A good project for using up some squirrelled away scraps too. beautiful work. thanx for sharing. Oh! It's magnificent! I particularly love the birds and vegetables …. 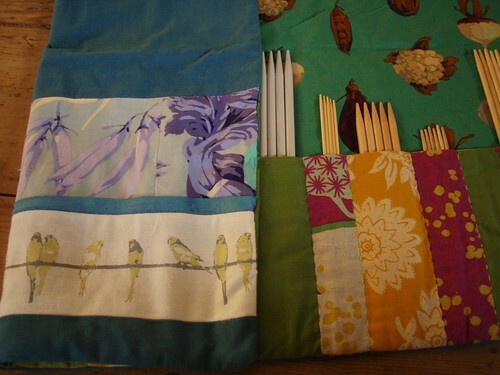 Lovely fabric combinations! Have some of those Martha Negley's veggie prints in my stash too.